Climate agreement for rail: are we going to get there? The railway industry aims for a 30 per cent reduction of greenhouse gasses by 2030. This is part of the climate agreement signed in Katowice last month. Are we going to get there? was the central question asked in Brussels on Tuesday evening, where the industry came together to discuss the commitments made. The commitments were made at the 24th session of the Conference of the Parties (COP24). It resulted in a clear rulebook to implement the Paris Agreement on climate change. The EU plays an instrumental role in climate diplomacy and pushed for higher ambition in making the Paris Agreement operational. Furthermore, just before COP24, the Commission adopted a vision for a climate-neutral Europe by mid-century. 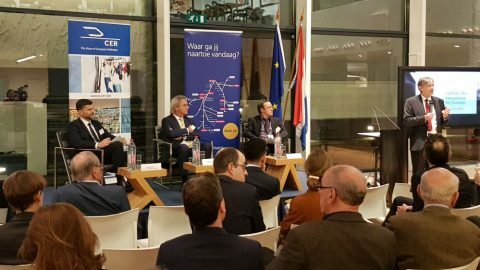 Rail transport plays an important role in achieving these goals, emphasised the European Railway and Infrastructure Companies (CER), which organised the roundtable discussion in Brussels yesterday. CO2 emissions from rail account for less than 3 per cent of CO2 emissions from transport although it carries 17 per cent of inland freight and 8 per cent of passengers in Europe, the lobby group pointed out. Measures that can be taken by the industry are for example electrification of the fleet, recovery of braking energy, efficient energy consumption in train driving, automated train operation or improved traffic management. Meanwhile, policymakers should focus on the electrification of the railway network, create a level playing field for rail compared to road transport, and support research and innovation with a focus on the marketability of clean technologies and multimodal solutions, argues CER. Stefaan Vergote, Head of Strategy and Economic Assessment of the DG Climate Action at European the Commission agreed that rail is already leading as a clean transport mode. The level of electrification should be an example for many other modalities, such as rail, he noted. In order to contribute to a climate neutral transport sector, the shift to rail should be supported on all levels, believes the CER. Part of these efforts should be on the internalisation of external costs for all transport modes. Currently, charges in the form of vignettes or tolls are only applied to trucks on about 20-25 per cent of motorways and main roads in Europe. As such, trucks pay, through taxes and tolls, around 70-90 per cent of their total infrastructure and external costs and if taking into account all roads in Europe, cost coverage is 30 per cent on average. At the same time, a modal shift is not possible without the necessary improvements to make rail more attractive. Member of EU Parliament Wim van de Camp commented: “A modal shift is almost impossible, as railway is old-fashioned and not flexible at all.” It it really wants to gain its share on the market, it should speed up with the developments, he believes. Majorie van Leijen is editor of RailFreight.com, online magazine for rail freight professionals.